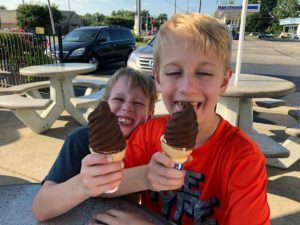 Southern Indiana residents know Zesto Ice Cream is the place to go on a hot day! 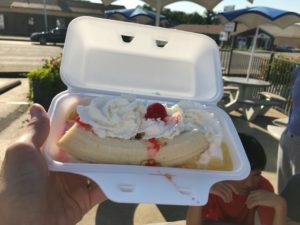 When the temperatures hit the triple digits the first thing we thought of was ice cream so we took a trip down memory lane (for my husband) and visited Zesto Ice Cream in New Albany. 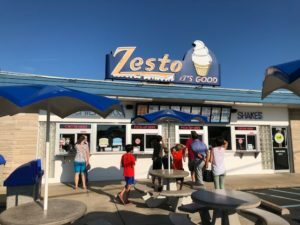 After indulging at The New Albanian for pizza, Zesto was a quick drive around the corner for sweets. Zesto is a drive-thru or walk up ice cream stand. I did not notice any restrooms, so keep that in mind when you go. They offer meal deals that include hot dogs, chicken sandwiches, or pork sandwiches with a drink and chips. Zesto also has lots of ice cream options! They have homemade hand dipped ice cream, soft serve ice cream, frozen yogurt, smoothies, sundaes, and the Vortex (similar to a Blizzard). They even offer a few coffee choices as well as with a hand dipped ice cream flavor (or two) of the week and a special flavor Vortex of the month. Our group stuck with soft serve ice cream on this visit and we all enjoyed our choices. The banana split was so good that it was almost eaten up before I could take a picture and my hot fudge sundae was tasty. Both of my boys tried the chocolate dipped soft serve and enjoyed them very much. Seating was available out in front of the store. Some of the tables had umbrellas while some did not. Because it was so hot outside we ate quick and then went around the corner for a visit to Empire Comics for some more fun. Zesto Ice Cream is located at 2740 Charlestown Road in New Albany, Indiana and they also have 2 other stores located at 301 E. Lewis and Clark Parkway in Clarksville, Indiana and 7601 Highway 311 in Sellersburg, Indiana. 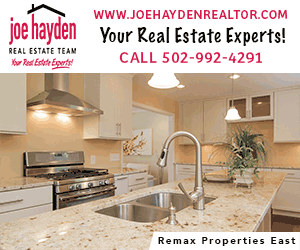 Check out their website and Facebook page. Find more Ice Cream and Cool Treats!